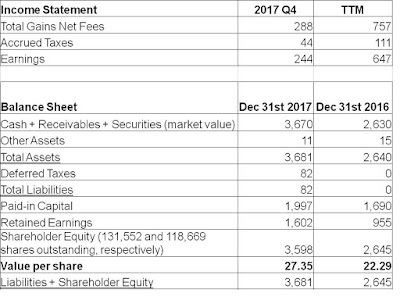 For the fourth quarter ended December 31st, 2017, KVF gained $1.85 per share, increasing the value of each share to $27.35. This result was about in line with that of the S&P 500, and outperformed the S&P/TSX and Russell 2000 indices. It was a good quarter to end a terrific year. Because of the emphasis on downside protection in KVF's portfolio, I would expect it to outperform during bear markets and underperform during bull markets. So when the portfolio can outperform during a bull market as it did this year, I end up pleased with the result. The positive results weren't so much a function of having a lot of winners...KVF has had just as many (if not more) winners in previous years. But there were far fewer big losers. It's possible that the portfolio manager has become better at avoiding frauds and value traps, but it's perhaps more likely that we are on a run of good luck, with mistakes on the long side getting buried under the trampling hooves of the raging bull that's upon us. 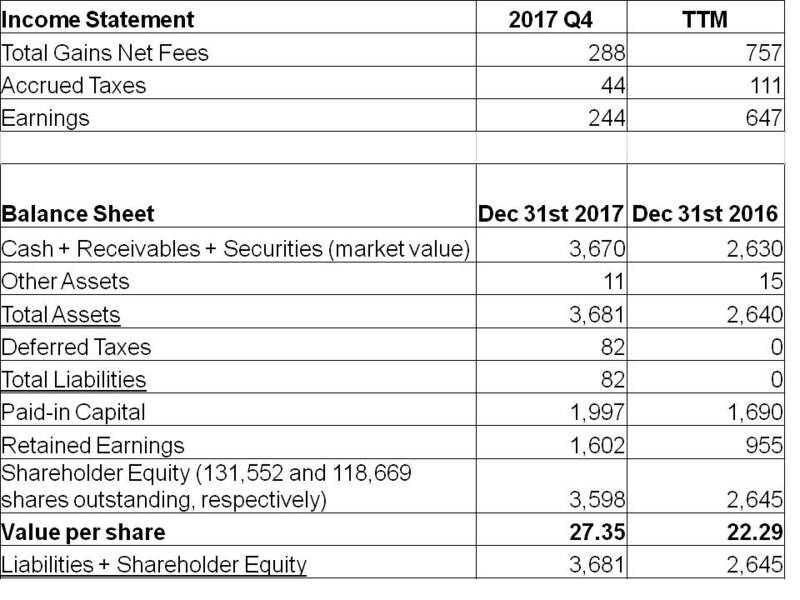 Helping returns this quarter was the strong price performance of Hibbett Sports (discussed here), in which KVF no longer holds any shares. Currency tailwinds also played a role in the quarter, increasing quarterly earnings by $0.04 per share. Finding value that can deliver future returns continues to get harder. While recent results are nice to have, I can't help but wonder if they are coming at the expense of future returns, much like the potential energy of an object gets sapped as its height is reduced. You did 23% this year?! Wow man I wish I copied you on some. Any of your current picks you recommend I take a look at? Best idea for 2018? That looks like an after-tax number. Congratulations on the good results Saj. It also looks like you were right and I was wrong (very wrong) on Alliance Aviation Services. That was quite the run it had in 2017.